Egg in a basket, toad in a hole, one-eyed sailor, hole in one, bird in a nest, egg in a frame, egg in toast, or…popeyes! What do you call this classic fried egg and toast breakfast? Popeyes are a fun way to add variation when your morning meals are getting repetitive. Use sprouted wheat or sourdough bread, eggs from pasture-raised chickens, butter from pasture-raised cows, and you’ll have a very nutritious and filling breakfast. I feel bad for those who don’t like fried eggs (ahem…my husband) because popeyes are the best! Cut a hole in the bread with an upside down glass or round biscuit cutter. Melt the butter in a frying pan on medium-low heat. Place the bread in the frying pan. Break the egg into the hole. 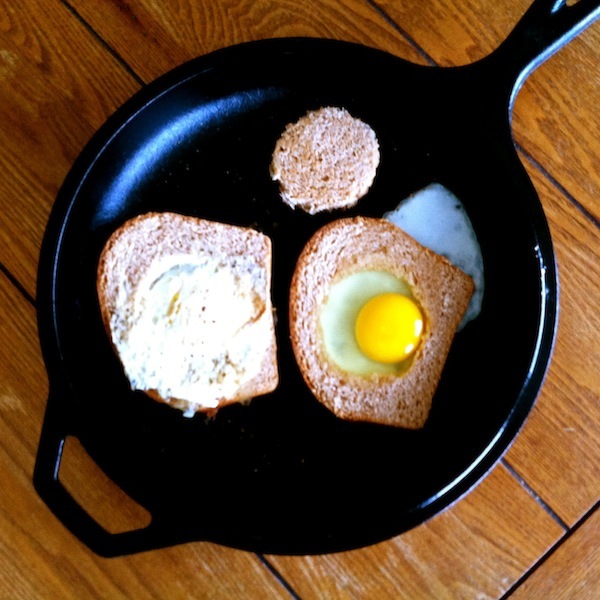 Cook until the bread is browned and the egg has set enough to slide in the pan. Flip the toast without breaking the egg yolk and cook until the other side has just browned. I like my egg over-easy so the yolk stays runny and will spread over the toast when eaten. Add the bread "hole" to the pan and toast it as well if you'd like.